Fellow professors: In the past few weeks/months, days, I know that many of you have looked on with intense jealousy and longing as the first-year students on your campus have participated in a variety of fun and stimulating orientation activities, many involving awesome bonding rituals and cool games. On some campuses, new faculty also have their very own orientation events. We old professors are entirely left out of all of these reindeer games. I am going to fix that. No, I am not going to start a nationwide or local crusade to convince administrators to (re)orient returning faculty. My efforts are going to be confined to this blog. Yes, I know that is ambitious, but I am highly caffeinated at the moment, and that is what I want to do. Activity 1. Everyone must stand in a (virtual) circle and hold (virtual) hands. Now, one person (not me) will stand in the middle of the circle and impersonate a chicken (I saw this with my own eyes not long ago while walking by an orientation flock and I have no idea why one of the orienters or orientees was imitating a chicken but it really happened and so we are going to do it as well, for authenticity). OK, now that that disturbing ice-breaking event is out of the way, I want each of you to think about your most memorable teaching experience. Now I want a volunteer to act out this experience, without any words, and the rest of us will try to guess what happened and whether it was a good or bad experience. You, over there on the right, the professor with the hair, you can go first. Great! Thanks! Now let's guess what happened and why it was so memorable. Activity 2. OK, professors, now take a seat anywhere over there, and try to sit next to someone you haven't met yet, even if they are from a bioscience department. Introduce yourself to the person sitting on your right (name, department, PhD year/school, h-index), and ask each other What is your favorite dimensionless number? If you feel an egg being placed on top of your head, you must stand up and explain your new friend's favorite dimensionless parameter to the rest of the group. After you meet your neighbor, I want you take a piece of paper or a personal electronic device and draw a graph that accurately depicts how you feel about advising a typical graduate student, from before they arrive on campus up until their thesis defense. The x-axis is time, but on the y-axis, you can graph any emotion that you want. Add whatever labels you want. Sure, that's fine, you can use a log scale. Whatever best depicts your feelings through time. Yep, negative numbers are cool, too. No, I don't think it's a good idea to have your time scale be too fine. If you use 15 minute increments, you won't be ready to share with the rest of the group when we have circle time in about half an hour. If the red marker is dry, you will just have to use a different color. Yes, you still have to draw the graph even if you don't have a red marker. You can use any color or colors to help you depict your emotions. If your iPad battery is dead, you are just going to have to use paper. No, you cannot leave now. Sorry, we do not have real graph paper. No, not even a straight edge. The graph doesn't have to be perfect, it just has to convey your feelings. Please don't calculate the slope of each line. Just make a picture that you can show and explain to your new friends. This may be your finest post ever, FSP. My most memorable teaching moment would be any time that a student doing a project experienced a "Eureka!" moment. The best pictorial representation would involve a naked person running through the streets of Syracuse. My feelings on advising grad students? Well, I've only had one grad student, and a colleague reads your comments section and has deduced my identity, so I'll lie and say that the graph would be my happiness vs. time and would have a very large positive slope. I LOVED THIS!!! I think I will have the faculty do this at our next meeting (came in as head two months ago). "Introduce yourself to the person sitting on your right (name, department, PhD year/school, h-index), and ask each other What is your favorite dimensionless number?" Hahahah. This just made my day. It's satirical, but it's funny because it's n% true, and that n% truthiness helps me retain perspective on this weird business. Sadly, I have no time to participate in such activities but you totally brought a smile to my face and a LOL to my office. Thanks! During our freshman orientation we were required to participate in a series of team building activities. The goal of unifying the group was met, in that we were all in agreement that it was a total waste of time, and, frankly, lame. Even the supervising professor broke out with a "This is ridiculous! I'm not doing that!" on one activity, earning him great respect from the students. OMG, Professor I am so sorry to interrupt your fascinating explanation of the ZigZag Conundrum, but I have a giant caterpillar on my head! PLEASE STOP SHAKING THAT LASER POINTER ALL OVER THE SCREEN!!!!!!!!!! 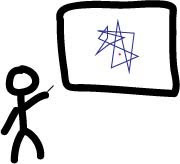 caption: "I was trying to explain how to levitate, but this one student kept keeping one foot on his chair." I wouldn't participate in any b.s. plotting exercise that doesn't require confidence intervals. Too bad I'm a scientist and I know better, but otherwise I would conclude that your new living arrangements inspire you to write better posts. I (mostly) love your blog, but you should get the Nobel prize of blogging for this one. I'm the person standing on the chair, every day before I lecture. We're too cheap for a projector remote, so since I teach the first class of the day, I get to climb on a chair and turn on the projector by hand. Recently, it has been having trouble finding the computer, so now I get to stand on the chair and wait while it loads, then push the source button.